For the 1970 model year, Plymouth designers were tasked with "muscling up" the staid Valiant. The Duster retained much of the Valiant's parts, including the chassis and floorpan, front end styling, drivetrain, suspension, and more, though it was a completely different car in most respects, with a more steeply raked windshield and a two-door fastback roofline. The Duster came with a choice of four powerplants—two slant-sixes with either 198 or 225 cid, and two V-8s with 318 or 340 cid. Power ranged from 125 hp in the small slant-six to 275 hp in the high-performance Duster 340. That car was priced at only $400 more than the base model, but with it came a four-barrel carb, three-speed manual, heavy-duty suspension, front disc brakes, and more. The car had officially been named the Valiant Duster, but for 1971, "Valiant" was dropped. The Duster 340 received a new "sharktooth" grille, and a Duster Twister appearance package debuted, which added Duster 340 looks to the lower models of the lineup—Rallye wheels, side stripes, the "sharktooth" grille, a flat black hood with scoops, and bucket seats. 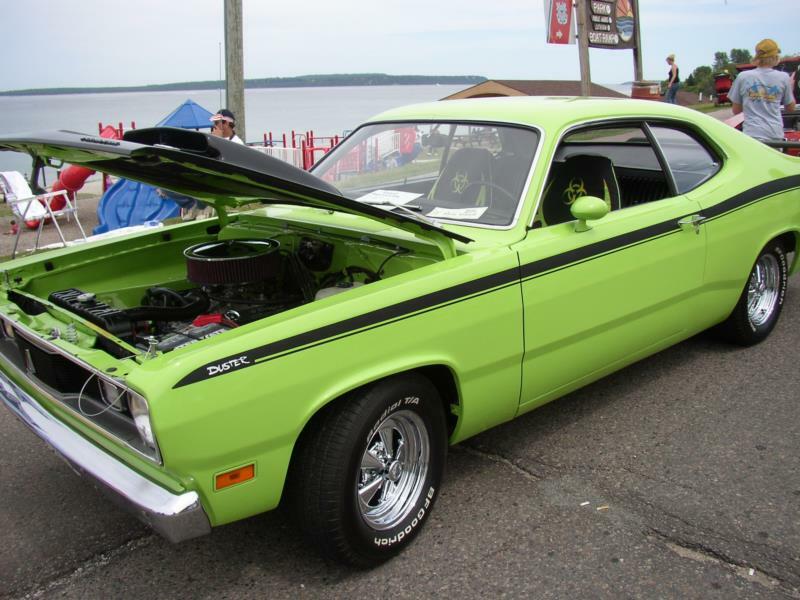 The following year, horsepower fell across the range, as Plymouth adopted the SAE Net standard while also reducing compression on the Duster. As a result, Duster 340s were now rated at 240 hp. 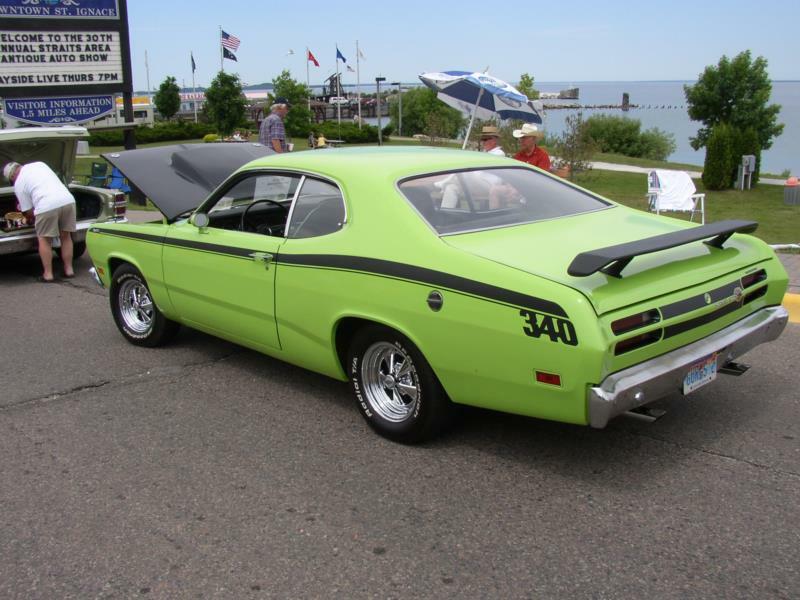 Dodge dropped the 198-cid slant-six, and Twister models lost their special hoods and grilles, while the Duster 340's single hood scoop was changed to a dual scoop. A redesign came in 1973, with a refreshed front end—including bulky 5 mph federally mandated bumpers as well as new taillights. A new Space Duster trim joined the lineup alongside the Twister as well as the Gold Duster model, a decal special that first appeared in 1970. The Space Duster featured a folding rear seat and carpeted trunk, which provided increased cargo space. Big news for 1974 was the replacement of the popular 340 V-8 with a 360 V-8, while 1975 included another restyled grille, plus another new trim—the Feather Duster—which included the 225-cid slant six and incorporated lightweight aluminum parts for reduced overall weight. The car was rated at an impressive 24 mpg in the city and 36 mpg on the highway. In its final year, power dropped again across the range, with the Duster 360 now developing 220 hp. 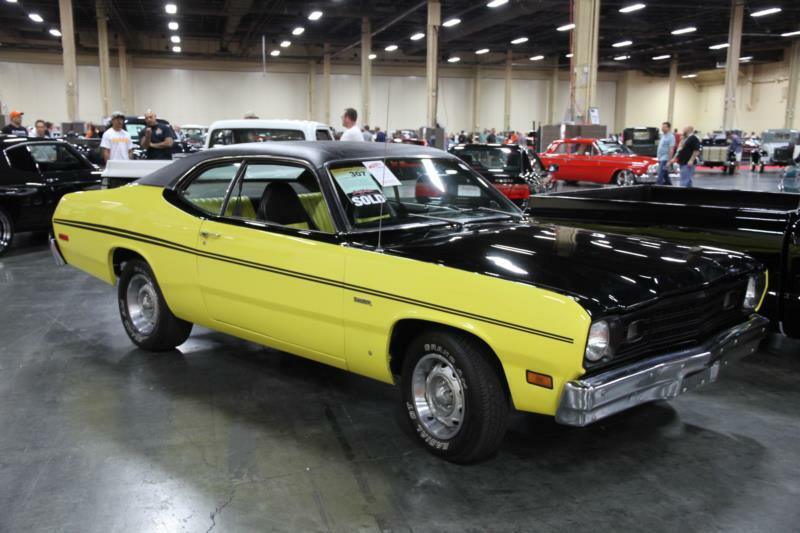 After more than 1.3 million Dusters had been sold, the car was discontinued, though the Duster name would live on in subsequent cars like the Volare and Sundance.